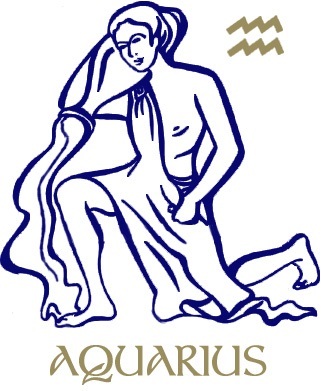 The Aquarius New Moon occurred at 6:14 am MST on January 20th 0 degrees Aquarius 8 minutes. Here’s the chart: AquariusNewMoon2015. Aquarius is perhaps the most misunderstood sign. Many mistakenly think it’s a water sign because it’s represented by the ‘Water Bearer.’ However, the ‘water’ being poured from an urn symbolizes ‘cosmic knowledge’ for all humanity. As the final air sign (following Gemini and Libra) Aquarius reflects ‘cosmic mind’ and the highest levels of human intelligence and consciousness. This sign carries information invisibly through the air waves which explains its wavy glyph. Those two squiggly lines are energetic frequency waves, not water waves. Accordingly, Aquarius rules energy, electricity, lightning, radio, crystals, prayer, Reiki, technology, computers and the internet. Aquarius’ evolutionary intention is liberation. It seeks freedom from all outer sources of conditioning that expect conformity to consensus or mainstream values, beliefs, opinions, norms, traditions and even taboos. The primary sources of this conditioning are family, religion, culture and society. Breaking free sometimes requires a revolution! It nearly always requires an ability to step back, emotionally detach, and observe people and circumstances dispassionately in order to see them clearly and objectively. Fortunately, Aquarians have all of these abilities naturally! They’re often accused of being aloof and unemotional and indeed they can be. But not because they’re unfeeling or uncaring. Its simply because they possess these essential abilities that facilitate their evolutionary growth intention – to break free so they can be who they truly are – unique and different individuals. This is no small task! Human history is full of evidence of what happens to those who refuse to conform to religious, social and cultural norms. Those who rebel against these norms are often judged, criticized and dismissed. And these are the ones who got off easy. Others have been hated, reviled, rejected, exiled and even tortured and killed. Individuals who refuse to follow the ‘rules’ often experience trauma. When the masses refuse and rebel, we have a revolution! These unique Souls also naturally understand social systems and can more easily ‘see’ the limitations of mainstream, consensus reality or what we call the ‘status quo.’ They can also ‘see’ the future and often become social workers and scientists, politicians and revolutionaries who invent and discover solutions to society’s problems. These folks often lead the way towards progressive breakthroughs that move societies forward. Uranus rules Aquarius and therefore this New Moon. It passed over the South Node of the Moon just hours before the New Moon. The South Node represents the past and what we need to let go of in order to continue evolving towards the future. With Uranus currently transiting through Aries, the sign of the self, an imbalance of self-interest or selfishness that undermines the health and well-being of the whole must be relinquished. To solve many of the problems we face in our world today requires a new awareness of how what each of us does as individuals affects others. We need a new mindset that remembers that we’re all connected. Indeed there is evidence everywhere that humanity is awakening to the fact that we’re all in this together. We are waking-up to the fact that we MUST work together to find solutions and heal ourselves and our planet. We must each find ways to express and share our individual talents with one another. We all win when we link our personal creativity with the needs of others to meet the goals of our larger communities. Fortunately, Venus and Mercury are also both in Aquarius now and opposite retro Jupiter in Leo. Together, Leo and Aquarius reflect the interplay between individuals and groups, parts and the whole. Through Leo/Aquarius we develop an ability to see how the diversity of individual creativity strengthens the group or whole. As you express your unique and special gifts with others in service to the greater good, your individuality will shine, bringing the personal recognition you desire and deserve. 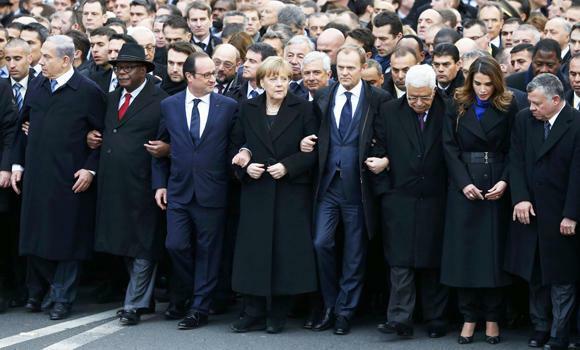 World leaders march in unity in Paris following terrorist attack on satirical magazine offices of Charlie Hebdo. So this New Moon pattern reflects the end of an old era and the beginning of a new one. Its time to let go of fears associated with our differences. Its time to let go of old social, economic, religious and political paradigms. We’re birthing a new era marked by a awareness of how we are all one human family. We’re experiencing a growing consciousness of unity, wholeness and a realization of the universal connectedness of all people and all things. While social structures (the old order) the world over increasingly dissolve into chaos (Aquarius) it’s perhaps encouraging to realize that chaos is NATURAL. Its very purpose is the dissolution of old forms so that new forms (new order) can be created. Through Aquarius, the sign of ‘cosmic mind’ that rules energy (and chaos) one of the most important realizations we can embrace now is the recent quantum scientific discovery that consciousness creates reality. Thoughts and feelings are pure energy. Consciousness is ENERGY! We now KNOW that what we think, feel and believe, in each and every moment, contributes to the co-creation of both our individual reality and experiences, and simultaneously to our collective reality and experiences. To better understand how consciousness creates reality, watch the following brief YouTube videos. They offer dramatic visual demonstrations and explanation of how energy (sound frequencies) affects matter and how chaos is a process that naturally occurs in between the dissolution of old forms and the creation of new forms. For more information about how energy frequencies affect matter, check out Masoru Emoto’s breathtaking photography of the crystalline structure of various water molecules exposed to different thoughts and feelings. Keep in mind that our bodies are primarily made of water! Thoughts are things! Energy flows where attention goes. So of course, how we think and what we believe in shapes the quality of our consciousness. In turn, the quality of our consciousness is reflected in the realities we co-create. If we really want to break free, we must take complete responsibility for the quality of our thoughts and feelings. If we want to change our realities, we must change the thoughts and beliefs that underpin and inform them. This New Moon is favorably connected to Saturn in Sagittarius. This connection supports our ability to liberate ourselves from old disempowering, fear-based beliefs that have falsely taught us that we’re separate from one another and from the Divine Source that created us. Its time to let go of old beliefs and the faulty delusional interpretations of reality that result from them. The Sun and Moon are also semi-square Chiron in Pisces offering an opportunity to reach for higher guidance and inspiration that can help us heal old wounds. A lesser manifestation of this same planetary combination can also lead us to re-imprint wounds if we cling to a consciousness of victimization. Align your personal will with higher divine will. From this higher perspective, its easier to recognize that we’re ALL ONE, which in turn enables a natural compassion and forgiveness of self and others. This is the highest expression and manifestation of Chiron in Pisces. Mercury goes retrograde from January 21 to February 11 prompting a review of differences, conditioning, and traumas. If we can step back, emotionally detach and objectify these events and experiences, we can realize the evolutionary purpose and necessary lessons involved in our most painful experiences. As a result, we can heal our past so we can move forward into a healthier future. Once liberated, we can more freely share our unique and special gifts in ways that naturally contribute to and serve the whole. Its time for a revolution. The revolution underway is a breakthrough in human consciousness. Its time to celebrate our differences. Its time to celebrate our wholeness. Its time to celebrate Unity in Diversity! This article is written a summary of my live one-hour presentation that analyzes and explains the energies and influences of the New Moon chart in-depth. The audio recording is available in CD or mp3 file formats for $15. Contact me if you wish to purchase the audio recording. The Pisces New Moon is on February 18th at 4:47 pm MST! Copyright 2015 Donna Lee Steele All rights reserved. This entry was posted in Planetary Events and tagged air, Aquarius, awareness, breakthroughs, cosmic mind, detachment, different, electricity, energy, freedom, friends, groups, individuality, insight, intelligence, liberation, objectivity, projection, rebel, revolution, technology, trauma. Bookmark the permalink. Capricorn New Moon, Winter Solstice and 2015: Out with the Old, In with the New! Aquarius New Moon 2.0 – Revolution is in the Air! What a great time to be here!